At Kilter Termite and Pest Control, we provide homeowners in Fall Brook, California, with an alternative to whole-house fumigation that is safe, convenient, and effective. 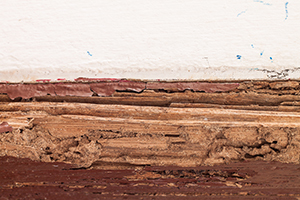 Rather than tenting, which forces homeowners to spend additional money on accommodations during the treatment process and is not always effective at permanently ridding homes of subterranean termites, we use a specialized termite treatment system called KILGUARD. This innovative treatment product is proven-effective at eliminating both drywood and subterranean termites, and because it is injected into infestation sites, it prevents termites from returning. What’s more, it is safe for families and pets, so there’s no need for our customers to leave their homes or bag up food and medications. We provide free inspections from experienced technicians who will determine the extent of your infestation and provide an accurate estimate. We’ve been recognized for our excellence by third-party organizations, including Pest Control Technology, which named us one of the top 100 pest control companies in the nation. Our termite control services are backed with a two-year warranty, so you won’t have to worry about recurring infestations. If you’d like to learn more about the termite treatment services that Kilter Termite and Pest Control provides in Fall Brook, CA, and the surrounding areas, contact us today. Also, ask about how we can restore areas of your home that have been damaged by termites with our wood replacement service.